…what do I do next? Sadly, millions of investors will never know. For them, the markets are like a one-way street to financial hell. Lacking any sort of cohesive plan, they lurch from one "investment" to another only to doom themselves to subpar returns. Fortunately, you're not among them. As a Money Morning Member, you have a tremendous advantage, especially on days like today, when the Dow Jones Industrial Average plummets. By your actions you have separated yourself from the proverbial herd. And, most importantly, you have a plan, a focus, and an objective – to build Total Wealth no matter what the markets throw your way next. So let's tackle that question with an answer that is as powerful as it is simple. And, while we're at it, let's highlight a recommendation that's uniquely suited for today's chaotic markets. Believe it or not, professional traders don't wake up in the morning and think about how much money they're going to make like everybody thinks. Instead, they roll out of bed wondering what could cause them to lose money and how they're going to avoid it. Because they know – like we do – risk is where you start. How much money you make is a function of what you don't lose in the first place. Never forget something we've talked about many times – the markets have an upward bias. 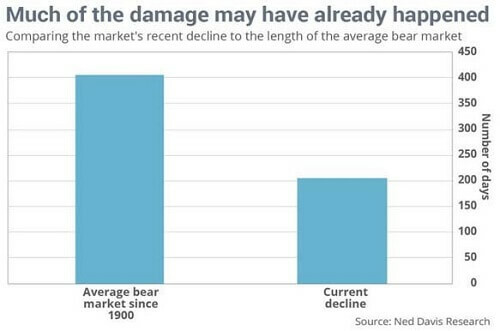 In fact, the current decline is already longer than half the length of the average bear market since 1900. That means much of the damage everyone fears could get worse may already be in the history books, according to Ned Davis Research data as reported by MarketWatch. I don't disagree. Stock market corrections tend to end a whole lot quicker and more dramatically than most people expect. That means the most appropriate question today is not should I sell, which is what most people think. But, rather, how do I handle what happens in the meantime? By putting risk management first – above all other considerations. Do so and the returns will come – even on days like today when the markets are getting carried out feet first. Put your money to work only where it's backed by one or more of the Unstoppable Trends we follow. Buy only the highest quality companies selling "must-have" products and services. Sell selectively, not emotionally, using trailing stops, inverse funds, and put options to control risk. Rebalance proceeds according to Rules 1 and 2 – and if there's nothing you want to buy, don't. I know I risk sounding like a broken record, but hang in there. There is a method to the madness. The strongest investments are always companies backed by trillions of dollars in spending that no government can screw up, that central bankers cannot derail, and that the world can't live without. In good markets and bad, these are the companies that take off like rockets when the markets are healthy, and the ones that provide unparalleled stability when they're not. For example, Bristol-Meyers Squibb Co. (NYSE: BMY) fell sharply in concert with the broader markets from June 15, 2008, to June 15, 2009, dropping only 3.19% even as the S&P 500 lost more than 32.09%. Then, as more seasoned investors realized that the company's value was far out of line with its potential, the stock took off. Ultimately, it rose 208.57% versus a still fabulous but comparatively mundane 41.30% from the S&P 500. It's worth noting that the company continued to increase its dividend throughout the entire Financial Crisis. So income investors loved it, too. It's easy to be emotional when the headlines get rolling and you're being bombarded by terrifying messages from every angle – your friends, your phone, your tablet, your computer, and even the newspapers, as quaint as those seem these days. It's not that you don't want to be logical. Rather, you can't. Your brain simply isn't wired that way. You have to train it. The average investor used to go through one or perhaps two serious downturns during his or her investing lifetime. Then, following the dot-bomb crash of 2000, things sped up. 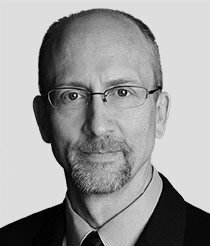 The Fed started goosing things, international trade accelerated, and derivatives came on the scene, as did computerization. Current investors have watched their 401Ks get turned into 201Ks twice in the last 16 years. It's normal to fear this is happening again. This is where most investors go off the rails and why you won't. Over the last 34 years, I've studied, experienced, and lived through thousands of ups and downs in everything from individual stocks to currencies to commodities and, yes, the broader markets themselves. Consequently, I've become proficient at navigating them. Not perfect – that's different. This is due to something social scientists call "chunking." Your brain unconsciously begins to organize subtle patterns into coherent blocks of information. That, in turn, helps you build a larger and larger body of knowledge and – here's the key – rational responses to extreme stimuli like the fear of loss. The U.S. Navy SEALs take this concept to an entirely new level, which is why they train so hard that actual combat seems easy despite being one of the most chaotic, frightening things anybody will ever encounter. SEALs learn to shoot accurately. Then, to shoot while running. Then, to shoot while running, winded, hungry, and cold. Then, to do all that in total darkness with people trying to kill him. Over time, every SEAL becomes proficient under a wide variety of scenarios and situations that would kill the average individual. That's why I continually come back to key concepts like our Unstoppable Trends, "must have" companies, and specific investment tactics. I want you to be financially proficient – no matter what the markets dish out next. That way you will not panic, nor will you give in. Instead, you'll seize every opportunity the markets hand to you when other people are giving in to their emotions. When I began today's column, I promised you that a recommendation that's ideally suited for today's market madness: Coca-Cola Co. (NYSE: KO). The company makes a wide variety of fizzy favorites but now has branched into everything from tea and coffee to milk and even sports drinks. I've followed the company for some time, but I think recent market turmoil has handed you an amazing opportunity. The company has paid dividends since 1920 and increased its dividend for 54 consecutive years through thick and thin. The last four years have been particularly appealing for cash-starved income investors and reflect a dividend growth rate of 9%, according to Bloomberg. The company is only 4% off its 52-week high, despite the fact the S&P 500 has dropped 11% and the Dow is off 13% over the same time frame. Shares seem to be consolidating in the mid to low $40 range, so there's plenty of strength there despite the fact that sales are projected to drop by 9% thanks to a strong U.S. dollar, and profits may drop 16% when it doles out Q4 numbers on Feb. 9. The company plans to cut more than $3 billion in expenses by 2019 in a margin-expanding move based on production optimization, refining supply chain operations, and refranchising. Especially in bad markets when cash counts and you need every advantage you can get. Follow Keith on Twitter and Facebook. I have to disagree with you calling this a bear market. DJIA went above 18k, then 15k, then a little below 18k, and now 16k. It's an undecided, sideways market. The bear part hasn't even started yet (not saying that it will). We'll probably see 17.5k next, then 16.5k, then finish the wedge around 17k. After that, it'll break out of the wedge, either in the form of a major dive or a rocket upward. My point is that this is more likely a wedge than a bear market.